History: Gracie is a black Irish girl, with her dam (Hi Cashel Betsy) and sire (Go Wild Teddy) both being Irish. However, American, Molotov, even made it into this Irish girl’s pedigree. 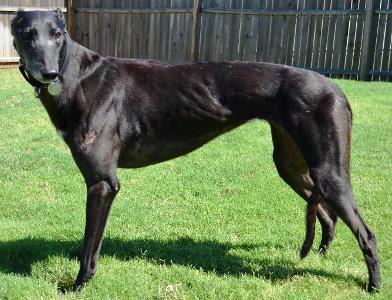 Although Greyhound-Data.com only shows Gracie had 8 races, her information on Trackinfo.com reflects that she ran 65 races between September 2008 and November 2009. 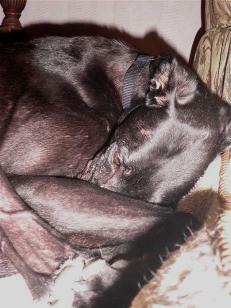 She was retired to the farm in late 2009 for breeding although Greyhound Data does not show any offspring for Gracie. 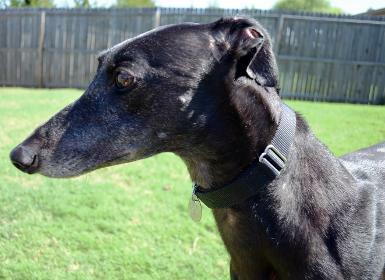 Gracie’s coat is a little “rough” but once she has a good bath, some good food and luxurious home living, her “inside coat” will look much better than her “outside coat.” Even though she was nervous on her first day with TAGS, she’s very sweet and responsive. She’ll be ready for her forever home in no time. Sweet Gracie snoozing in a little ball! 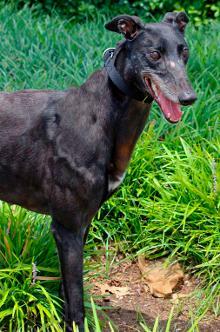 Gracie has gone to her forever home with Debbie, Linden, greyhound Staddler, and boxer Lobo. 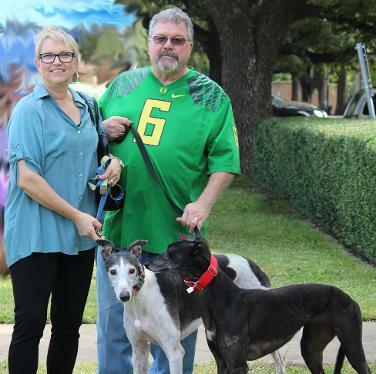 October 26, 2013 update: Gracie found her forever home with TAGS alumni, Staddler. Congrats to all. October 4, 2013 update: Gracie is adjusting well in her foster home and her personality is beginning to shine through her shyness. She is still quite timid around new people, but once she warms up, she sticks like glue. Gracie can be startled easily by loud or sudden noises, but with some reassurance, she settles comfortably. Gracie has come to enjoy the company of her foster sister and brother. They chase rabbits in the backyard and they love to go on walks together in the evening. Gracie currently sleeps in a kennel next to our bed. When the alarm sounds, she’s quickly awake and talking to let us know she is ready to go outside. After morning routine, Gracie goes back into the kennel while we are at work, but spends the remainder of the day and evening out and about with her greyt friends. She gets along well with our 2 older children and she doesn't seem to notice the cats. 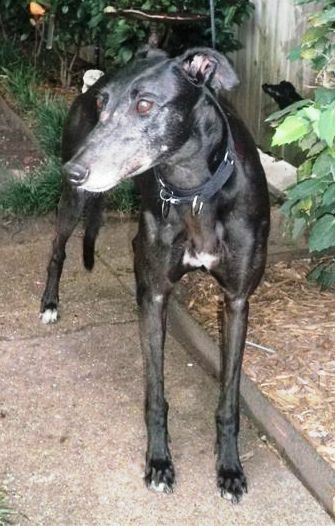 Gracie is a sweet girl and would make a wonderful addition to a home ready for this loving Irish lass. August 21, 2013 update: It seems like I always want to call her “Little Gracie” because she’s such a petite thing. Her sweet personality has really come through in the last few weeks. Once she figured out what living in a house was all about, she was all for it but in her own delicate way!!! It’s difficult to find anything negative to say about her. She’s very quiet but sweet. She crates well, sleeps well, eats well. She plays nicely with the other dogs although not as rambunctious as some of her housemates. She has taken to following the boys’ lead in chasing squirrels in the back yard. Gracie loads in the car by herself and rides well. At Meet and Greets she is still a little afraid of traffic noise. That’s still a foreign concept to her. She has learned to quietly and sweetly request attention by coming to you and standing by your side. She will let you pet her until you want to stop. 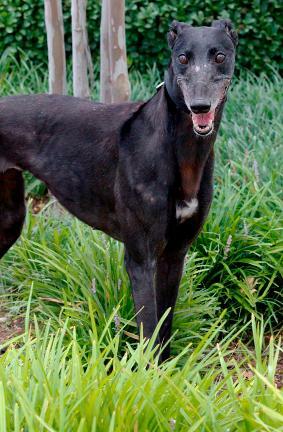 She is a beautiful shiny girl and the muzzle marks on her face have totally gone away. I sometimes take her with me when I visit friends who also have Greyhounds so that she can get used to different situations. 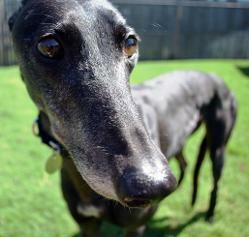 Gracie would probably make a good “first Greyhound” for a new adopter. She would also make a quiet addition to a home with existing pets, including small dogs and cats. July 18, 2013 update: Gracie is relaxing a bit and now wanders around the house with the other dogs, eats in the kitchen, relaxes on a dog bed in the den (although sometimes she wants to share with other Greyhounds who are not so eager). Gracie knows her name and responds, especially when you say, “Gracie, let’s go outside.” She still looks at you with a quizzical expression because she is still somewhat unsure. She wants affection so much and is learning to accept all of the human attention. Her sleeping habits, on the other hand, need no improvement. She can do that anywhere, anytime. Her coat looks more shiny, and the muzzle marks on her nose look better. 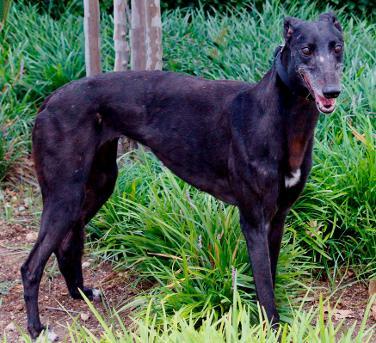 She has some white stippling in her coat which the black Irish dogs frequently have. She’ll be a sleek, beautiful girl in no time. 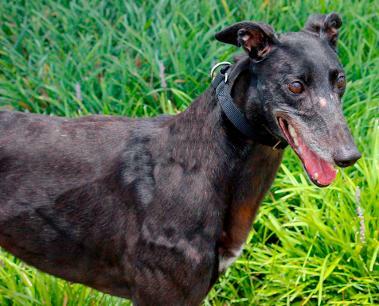 July 9, 2013 update: Gracie came to TAGS to find her lifetime home and to settle into retirement. 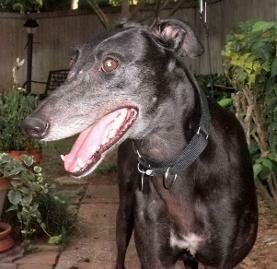 First evening with Gracie - from her foster mom: Gracie is doing AWESOME!!! She's such a sweetie. A little nervous at first, but she's settling in really well. She hasn't even given a second look at the cat and seems to pretty much ignore the IG's too. She's found a dog bed in the bedroom with me and is resting. She's going to be a good girl.